Desert Willow Golf Resort, Mountain View Hole 4: This relatively short par four swings right around the desert, but said desert can actually be flown by a fairly long strike off the tee. Of course, the angle to most pins is better from the left side of the fairway. Desert Willow Golf Resort, Mountain View Hole 6: This short, but tight par five is the first truly scary hole on the course. With a stream traveling all the way down the right side of the hole and bunkers on both sides of the fairway, the drive must be straight. The stream then crosses in front of the green and dumps into a pond on the left side of the putting surface. Thus, for those going for the green in two or in the three, the approach had better be accurate or penalty strokes will ensue. Desert Willow Golf Resort, Mountain View Hole 7: The most endearing thing about the Mountain View course is its aesthetic quality. Great landscaping and views of the surrounding desert are plenty. This hole, while designed nicely, really gets its gusto from the visual from the tee. The hole itself only poses a minor challenge. Desert Willow Golf Resort, Mountain View Hole 8: This par three is hit over desert that is not really in play, but the green-side bunkers are, and they should definitely be avoided. Desert Willow Golf Resort, Mountain View Hole 9: This long, uphill par 5 is split into two sections. For the drive there is water short (for a really poor shot) and right that must be avoided. The second shot will cross this stream and the rest of the hole is defending by sand, both from the surrounding desert, and bunkers. It provides a good combination of resort style desert golf. Desert Willow Golf Resort, Mountain View Hole 10: This par four seems fairly tame from the tee, but the approach is to a narrow, undulating green with a bunker right and water right of that that wraps around behind the putting surface. Back pin placements are particularly perilous. 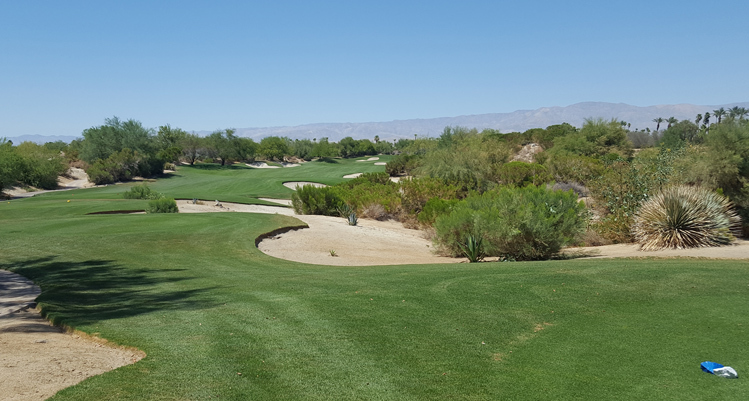 Desert Willow Golf Resort, Mountain View Hole 11: This long and challenging par three offers a simple choice: clear the water and hit the green or bail out left. The first choice is preferred as that is where the green is, but is not an easy task. The second option will leave a tough chip depending on the pin placement as the green-side bunkers are well placed to make the timid pay. 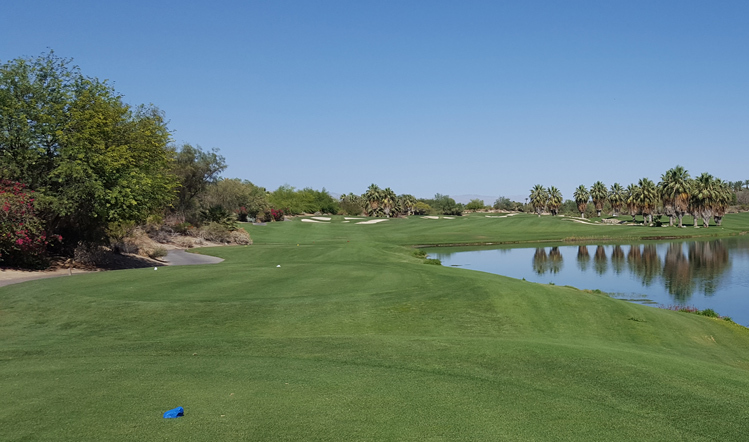 Desert Willow Golf Resort, Mountain View Hole 16: This dogleg left par four has a tough second shot as the green is narrow and the water to the right of the green is just barely off the putting surface. Desert Willow Golf Resort, Mountain View Hole 18: The finishing hole is a par five with water right and OB left, There is then water to the left of the second shot and the green.